The human rights abuses and war crimes carried out by the Pakistani soldiers and Bangladeshi irregular forces included the targeted mass killing of Hindus, intellectuals, and widespread sexual violence against women. The International Crimes (Tribunal) Act of 1973 provided for the establishment of a tribunal to prosecute crimes committed during the war. However, a few years after the Act’s initial adoption, the political landscape changed and all accountability efforts were put off until 2008. The trials began in October 2011. The Tribunal’s jurisdiction does not extend to former members of the Pakistani army, and therefore the Tribunal is not able to prosecute those individuals most responsible for the international crimes committed. All seven of the accused are Bangladeshis alleged to have assisted the Pakistani forces. 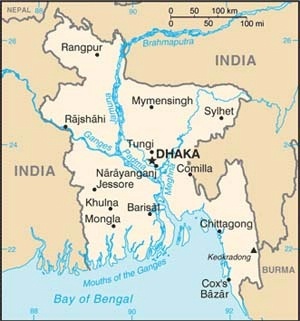 Yet officials also have emphasized that the International Crimes Tribunal is a domestic tribunal governed by Bangladeshi law. So what happens when these two sets of laws are in conflict or tension? ► Pre-trial and trial procedures. Thus, the Tribunal finds itself facing particular challenges prosecuting international crimes in a domestic court. These challenges include lack of national expertise in international law, debate over the relevance of international law in determining the definitions of offenses in the domestic statute, and evidentiary standards. Bangladesh, like the domestic tribunals in Iraq and Indonesia, has been widely criticized as politicized and failing to uphold fair trial standards. Yet in Bangladesh there is the perception that advocacy for international standards fails to take into account that the Tribunal has instituted due process procedures that are more generous than the accused would enjoy before the regular criminal courts. With these challenges, the spotlight is on Bangladesh to see if it can become an example that fair and legitimate prosecutions of international crimes are possible in a domestic tribunal. As interns in the International Human Rights Law Clinic at the University of California, Berkeley, School of Law, we have worked to support the Liberation War Museum, a leading Bangladeshi civil society group. The Liberation War Museum is dedicated to bringing effective justice to Bangladesh, a justice that addresses both international concerns about fair trial standards and the concerns of victims who have fought for 40 year to initiate trials. As part of its mission to memorialize the 1971 war and to contribute to accountability efforts, the museum has convened workshops regarding the International Crimes Tribunal. We recently participated in one held in Dhaka, Bangladesh, presenting our analysis of how the Tribunal may apply the principle of non-retroactivity to the crimes defined in the 1973 Act consistent with customary international law. Because the war crimes statute was enacted two years after the 1971 Liberation War, the issue of non-retroactivity has been flagged as a potential challenge to the legality of the ICT prosecutions. We found ample customary international law regarding the definition of crimes included in the Act. Because customary law is directly applicable, the Court is able to interpret the Act consistent with customary international law and therefore does not need to further amend the statute. Nevertheless, the fair administration of justice for international crimes requires a robust institutional infrastructure. ► First, it could take further measures to adapt and incorporate the best practices of other international and ad hoc tribunals, particularly with regard to victim protection. ► Second, to assist in this effort the ICT could enlist advisors or consultants with relevant international expertise to support Tribunal staff and prosecutors in these areas. ► Finally, the ICT could engage more directly with the public at large and with civil society. For example, we noted great interest among some national nongovernmental organizations to provide support to victims and witnesses, especially survivors of sexual violence who wish to participate in the Tribunal but who are living in vulnerable circumstances. Currently, there are no clear avenues for them to do so, absent guidance from the Tribunal. We are hopeful that the International Crimes Tribunal will seek and receive the support it needs and deserves to provide fair and legitimate trials that meet international standards. While the Tribunal is a national effort to end impunity, international law and its advocates have a role to play to promote the 40-year quest for justice pursued by victims of the 1971 Bangladeshi war. I feel obliged to respond to this posting. In fact, although transitional justice is badly needed in Bangladesh, the Bangladeshi War Crimes Tribunal is an egregious insult to the entire concept of war crimes and also, I might say, begs the very question of national tribunals on these matters. Full disclosure - my mother's brother is one of the defendants currently being tried before the tribunal. He, a senior ranking elected member of Bangladesh's Parliament, was arrested in December 2010, unlawfully detained without charges and tortured for a period of about 5 days, then paraded in the streets with his injuries. Amnesty International drew attention to his situation at the time - http://www.amnesty.org/en/news-and-updates/mp-tortured-security-forces-bangladesh-2010-12-22. I am also a U.S.-trained lawyer who has worked on human rights and legal reform issues in the U.S., Afghanistan, Thailand, Qatar, India, and Bangladesh. Setting aside my personal affiliation to the matter, the whole operation has been highly politicized and appears to be an avenue for the Prime Minister to settle some personal rivalries. In addition to the stark criticisms articulated by Ambassador Rapp, which were noted in tonight's IntlGrrls post, ICTJ, Human RIghts Watch, the International Bar Association, and numerous international legal scholars have criticized the tribunal for not conducting itself in a manner consistent with modern standards for war crimes tribunals. In November 2011, the UN Working Group on arbitrary detention deemed the detention of 6 of the defendants to be arbitrary, but the government has done nothing to remedy this. I can tell you honestly that this is a very scary situation and the Bangladeshi government doesn't seem to be scared or deterred or affected at all by any of the numerous criticisms of the international community. Despite all the criticisms I have highlighted, the government has been openly flouting its desire to hang several of the defendants, before most of their trials have even commenced. One of the international defense attorneys, a British citizen, was not allowed in Bangladesh last time he traveled there and was detained and harassed at the airport for 8 hours before being sent back to Dubai. I have attended hearings of the tribunal and they are conducted in a completely haphazard manner without any semblance of impartiality, where the sitting Attorney General and his Deputy are sitting alongside and advising the prosecution, where the defense is only allowed to bring a limited number of lawyers, and where the press is not allowed to report on what actually transpires. Now, there is reason to believe allegations that have come to the fore that the government exerted undue influence to procure certain statements from a number of witnesses in the case against the first defendant before the Tribunal, Mr. Delwar Hossain Sayadee. For anyone interested, I am happy to pass along a more detailed summary of the allegations and an English translation of a Bengali news report. The writers of tonight's blog also note that the tribunal needs and deserves support to help to give it legitimacy, but in fact the Tribunal has rejected offers of international observers and international judicial assistance. The whole thing is sobering and demands the attention of the international community. 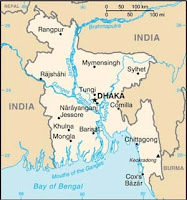 It is highly unfortunate that, because of Bangladesh's lack of geopolitical power, and the fact that India and Pakistan, the countries in the region that could wield some influence, are happy to see the Tribunal proceed for their own political motivations, this situation is ongoing with very little international attention. The US has certainly done what it could behind the scenes, but it demands attention - in fact, it demands outrage on the part of anyone who claims to champion these issues.